Lion Technology launched the Massachusetts Hazardous Waste Management Online Coursethis week to help industry professionals in the Bay State meet their responsibilities under the state’s hazardous waste rules. 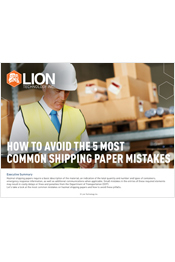 How do you properly ship a potential hazardous material when you don’t have the information you would typically use to classify, package, mark, label, and handle it? Read on to find out! When dozens or hundreds or employees are working in one building, having a concrete plan in place to guide evacuations and employee actions can not only save lives, it ensures that everyone gets out in an orderly and safe fashion. When is spontaneous combustion not just a plot device? When it's an ignitable waste, non-liquid D001. What happens when you have an article that contains dangerous goods, but that article is not identified by name in the regulations, like a fuel pump (pictured below) or a piece of lab equipment? On September 18, 2018, the Federal Aviation Administration (FAA) released an updated National Policy to “set forth policies and procedures relevant to FAA’s compliance and enforcement program,” including enforcement of hazardous materials violations.